This recipe is mostly protein and fat. Serve it with one serving of carbohydrates such as brown rice or another grain to keep it balanced. Dysphagia Level 1 – Pureed – marinade and cook pork according to recipe. Once cooled, put pork in a food processor and puree until smooth, adding liquid (water or low-sodium broth) as needed. Cook marinade according to recipe and serve on top of pureed pork. Omit sesame seeds. Dysphagia Level 2 – Ground/Mech Soft – marinade and cook pork according to recipe. Once cooled, put pork in a food chopper and chop into a ground consistency. 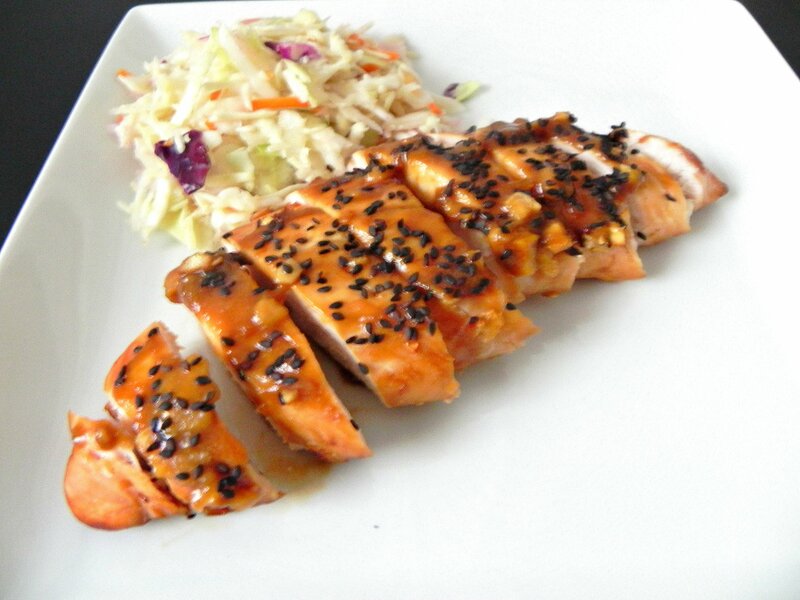 Cook marinade according to recipe and serve on top of ground pork. Omit sesame seeds. Dysphagia Level 3 – Soft – cook according to recipe. Omit seasame seeds. When ready to cook, lightly coat a non-stick skillet or grill pan with cooking spray and heat over medium-high heat. Grill the tenderloin for 3 minutes per side. Reserve marinade. If skillet is oven-safe, place skillet in oven and cook tenderloin for additional 15 minutes. If skillet is not oven safe, transfer tenderloin to an oven-safe dish and cook for additional 15 minutes. While tenderloin is cooking, pour marinade in a small saucepan and add 1/4 cup water. Bring to a boil until reduced by half. When reduced, stir in cornstarch until sauce thickens. Remove tenderloin from oven and let rest for 5 minutes. Pour sauce over tenderloin and cut into even sized pieces. Garnish with black sesame seeds if desired.